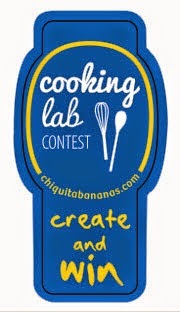 Chiquita Bananas is hosting a recipe contest. Eight lucky Grand Prize Winners will each receive $4,000 cash and have their winning recipe added to our site’s full collection of recipes. Each week 4 First Prize winners will receive a $100 Chiquita Kitchen Prize Package. Here’s a quick video that illustrates the general idea: http://bit.ly/1nOYgTT. This contest will unfold over eight weeks this fall, every week there will be a new theme, such as Halloween, Thanksgiving and seasonal family occasions. Over the contest entry period, Chiquita Bananas at your local grocery store will have banana stickers promoting the contest. The contest starts Sept 29th. Here are some ideas to get you inspired.